More than 60 top fusion scientists and engineers from around the world gathered at the 5th IAEA DEMO Programme Workshop in Daejeon, South Korea, from 7 to 10 May, to discuss critical issues and next steps on the road to the realization of fusion energy. While science and technology issues for fusion power are broadly agreed upon, upscaling the technology to commercial electricity generation is still decades away. This workshop aimed to help experts define the facilities and activities that can lead to the resolution of some of the key scientific and technological challenges to developing a fusion demonstration power plant (DEMO). Such DEMO would show that controlled nuclear fusion can generate net electrical power and mark the final step before the construction of a commercial fusion power plant. This would represent the next stage after ITER, the world’s largest fusion experiment under way, which is expected to demonstrate by the late 2030s that fusion can be used to generate net energy, i.e. produce more energy than supplied to it to feed the reactor. Crucially, however, it is not part of ITER's mission to convert energy into electricity and transmit it to the electricity grid. sufficient confinement to hold the plasma and allow the fusion reactions to take place continuously. The most performing confinement concept to date has been the tokamak, a doughnut shaped configuration first invented in the 1950s, which uses powerful magnets to confine the plasma. By now, these machines can provide the essential conditions for fusion, in terms of both plasma density and the required temperature, and fusion power can be generated. This video visualizes the operation of a tokamak-based fusion reactor. The missing piece to producing net power remains better confinement, which is a measure of how good the magnetic field is at keeping the plasma energy, for which a bigger tokamak, such as ITER is needed. Afterwards, the technological challenges of bringing fusion power to the electricity grid will be addressed by a DEMO-type reactor. Individual countries are exploring ways to do this, and the IAEA is providing a platform for information sharing and exchange in order to facilitate the research and technology development. China has made significant progress in planning for a device called China Fusion Engineering Test Reactor (CFETR) that would bridge the gaps between ITER and DEMO. Construction of the CFETR could start at around 2020 and be followed by construction of a DEMO in the 2030s. The European Union and Japan are jointly building a powerful tokamak called JT-60SA in Naka, Japan, as a complement to ITER on a privileged partnership called the Broader Approach Activities. In addition to constructing the JT-60SA, the joint programme consists of two other projects, the Engineering Validation and Engineering Design Activities for the International Fusion Materials Irradiation Facility (IFMIF/EVEDA), and the International Fusion Energy Research Centre (IFERC). This partnership represents a well-integrated approach to support ITER and to prepare to undertake the engineering design and construction of a subsequent DEMO. India has announced plans to begin building a device called SST-2 to develop components for a DEMO around 2027, and then start construction of a DEMO in 2037. South Korea initiated a conceptual design study for a K-DEMO in 2012 targeting the construction by 2037 with potential for electricity generation starting in 2050. In its first phase (2037-2050), K-DEMO will develop and test components and then utilize these components in the second phase after 2050 to demonstrate net electricity generation. Russia plans the development of a fusion-fission hybrid facility called DEMO fusion neutron source (FNS), a reactor that would harvest the fusion-produced neutrons to turn uranium into nuclear fuel and destroy radioactive waste. 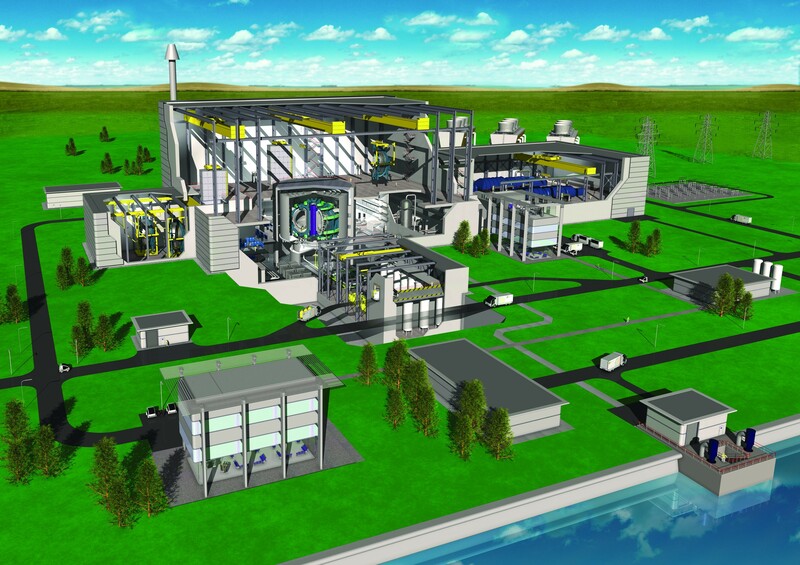 The DEMO-FNS is planned to be built by 2023, and is part of Russias’ fast-track strategy to a fusion power plant by 2050. The United States of America is considering an intermediate step called Fusion Nuclear Science Facility (FNSF) to be used for the development and testing of fusion materials and components for a DEMO-type reactor. Plans call for operation to start after 2030, and construction of a DEMO after 2050. Main findings and discussion carried out in the IAEA DEMO Programme Workshop series can be found here.